With the transport passes offering unlimited travel for 48, 72, 96 or 120 hours , you'll be able to get around the city and its surrounding area and save yourself time and money. 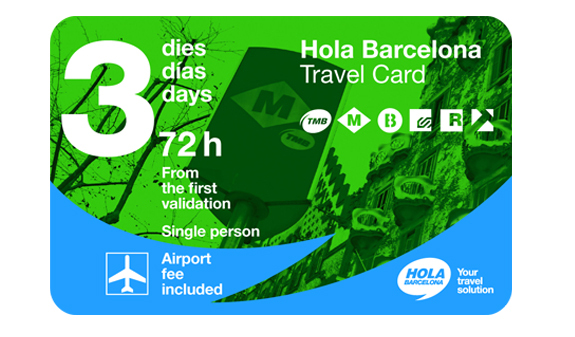 Discover Barcelona at your leisure and with peace of mind as you'll be able to use the metro, train to the Airport, buses and trams as many times as you like. Barcelona is the perfect city to explore on foot while you lose yourself in the narrow streets in its different neighbourhoods, enjoy its green areas and walk along the seafront. 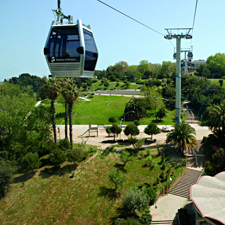 The city's metro and bus network, which is one of the best in Europe, is the best means of transport to discover the city. Use the travel passes that offer unlimited travel for 48, 72, 96 o 120 hours on the integrated central rail network and let the city surprise you while you enjoy the added convenience of being able to change your plans and use a specific means of transport. 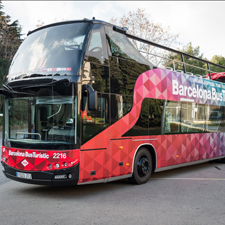 You'll be able to use any tram, bus (night buses not included) and metro line operated by the Metropolitan Transport System (TMB), the Ferrocarrils de la Generalitat (FGC) city network and RENFE suburban trains as often as you like. 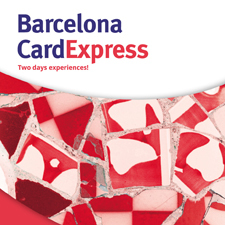 You can also use your card to travel from Barcelona Airport. 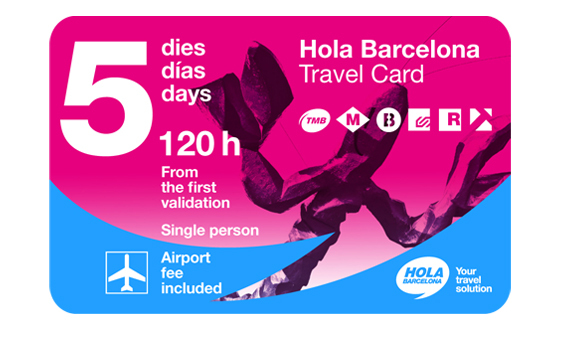 You can buy or pick up your card at the tourist information offices at the two terminals. 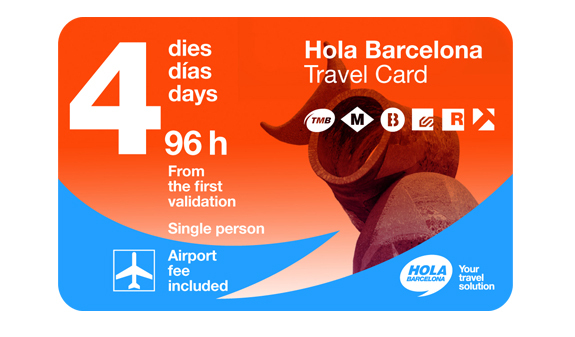 48, 72, 96 or 120 hours (from the first time you use it) travel pass. 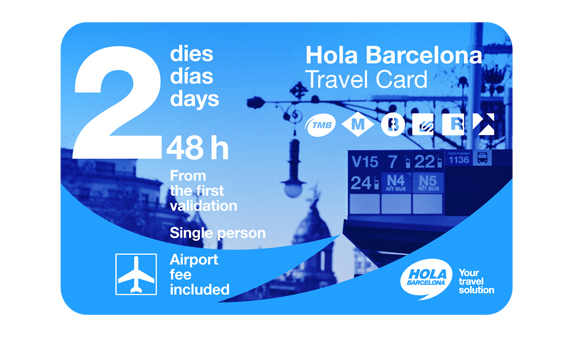 Offering an unlimited number of journeys on the metro and buses (night buses not included) operated by Transports Metropolitans de Barcelona (TMB), Ferrocarrils de la Generalitat (FGC) city network, Funicular de Montjuïc, the TRAM, Renfe suburban trains zone 1 and Barcelona airport metro and train. Airport, Terminals T1 and T2: Barcelona Airport. Daily from 8.30am to 8.30pm. 6/1 and 26/12: from 8.30am to 2.30pm. Closed: 1/1 and 25/12. Pl. Catalunya: plaça de Catalunya, 17-basement. Daily from 8.30am to 9pm. 1/1 open from 10am to 2.30pm. 6/1 and 26/12: from 8.30am to 2.30pm. Closed: 25/12. City Hall: Ciutat, 2. From Monday to Friday from 8:30am to 8pm. Saturday, Sunday and holidays from 9am to 3pm. Closed: 1/1 and 25/12. Sants station: pl. Països Catalans s/n. From Monday to Friday from 8.30am to 8.30pm. Saturday, Sunday and holidays from 8.30am to 2.30pm. Closed: 1/1 and 25/12. Mirador de Colom (Columbus Monument): plaça Portal de la Pau, s/n. Daily from 8.30am to 8.30pm. 6/1 and 26/12: from 8.30am to 2.30pm. Closed: 1/1 and 25/12. Plaça Espanya: plaça Espanya, s/n - Avinguda Maria Cristina. Daily, from 9am to 3pm. 6/1 and 26/12: from 9am to 3pm. Closed: 1/1 and 25/12. Sagrada Familia: plaça de la Sagrada Familia. Daily, from 8.30am to 7.30pm. 6/1 and 26/12: from 8.30am to 2.30pm. Closed: 1/1 and 25/12. *Information office opening times may be changed due to circumstances beyond our control.